Fanus came to Canada with her husband and two daughters aged 18-month old and 4-year old in July 2017. 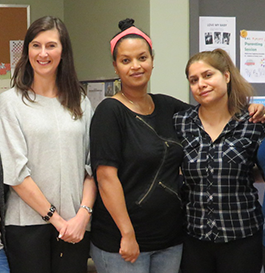 Several months after attending MOSAIC’s Family Centre program she was referred to other community programs. She had developed the skills and confidence to participate. One of these organizations, Pacific Immigrant Resources Society, offered “The Shoe Project”, a 12-week writing workshops, exhibits and performance in which immigrant women tell their stories of arrival in, and adaptation to, a Canadian community through a pair of shoes. During the workshops, she was coached in advanced English writing and performing skill by professionals. She performed her own story in the Museum of Vancouver in June 2018. In September 2018 she was invited to an event about celebrating the resilience and courage of immigrant and refugee women. Fanus and her children continue to participate at the MOSAIC Family Centre. She has made remarkable accomplishments in such a short period of time since arriving in Canada. Below is her story about two pairs of shoes! “It gets darker before the sun sets,” is an Eritrean expression of lost hope. I never wanted to leave my beautiful city and my lovely family, but there was no way to continue living in that terrible situation. Thousands of Christians had been arrested and imprisoned over the years, because of their faith. Persecution and violence were waiting for us so my fiancé and I decided to leave. I was in a rush to pack, worried only whether I would arrive safely, not about my clothes. Shivering, my heart melting inside of me, I walked out in flat-soled sandals, not suitable at all for the long journey ahead of me. My fellow-travelers teased me about it when they saw me. The journey started at night. The moon was prepared to give us light as if it were waiting for us. After four hours of walking in the desert, the sand and thorns had scratched me badly. My poor feet were washed with blood. Everyone offered Band-aids, but they were no use. I finally got treatment in the refugee camp in Sudan. I hated the sight of the sandals by then so I gave them away to a friend who had made the journey, too, to remember me by. But the journey didn’t end there. We moved to Ethiopia and lived there for about 8 years as refugees. In those years the Lord blessed us with a wonderful marriage and two adorable children and finally our family found a resettlement program in Canada. We had to prepare by buying clothes and shoes that might be of use in Canada. When the day came, my husband insisted I wear my brown boots. We all expected cold when we arrived, but I refused because the boots looked old and were too big. He argued saying they would fit if I wore two pairs of socks. Eventually, I agreed to fly in them. Our flight was on July 11th, 2017. We were all wearing our heavy winter jackets and boots. My boots gave me a terrible time during the long flight to Europe. My feet started to swell. While everybody else was sleeping, it was hard for me even to close my eyes. I woke my husband to complain about my discomfort, but he just went back to sleep. It was early in the morning when we arrived in Frankfurt. The sun was bright and the weather hot, even in the airport. We had to wait hours to catch our plane to Canada. By then I was boiling inside the boots and blaming my husband. We started taking off our coats and sweaters, but my boots were stuck on my feet. While we were arguing, we suddenly heard the boarding call for our flight. Immediately we realized that it was nonsense to argue about boots because soon we would be in Canada whatever the weather. In few hours all those hardships of life would be over. And we hugged each other. After a 5-hour flight, we arrived in Vancouver. Everyone but me was dressed in summer clothes. I felt ridiculous and for a moment I wished I had my sandals, not my embarrassing brown winter boots. Why did I always choose the wrong shoes? Then again, my painful boots had brought me to this peaceful land. After our near-decade in darkness, the sun had come out to welcome us.